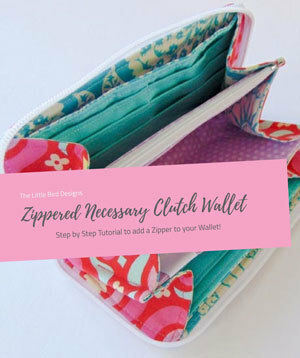 Welcome back for Part 2 of the Zippered Necessary Clutch Wallet! 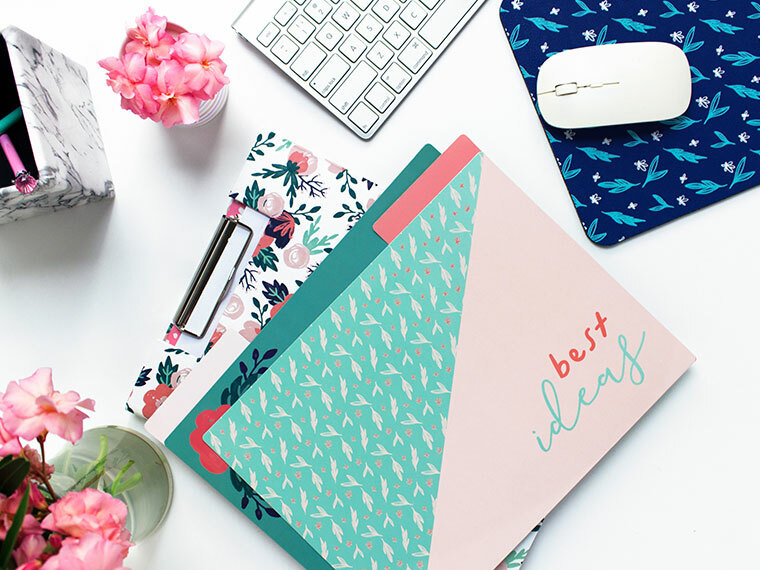 Please make sure you have read Part 1 and have purchased the Necessary Clutch pattern from Emmaline bags! Check the end of this post for a FREE download of the full tutorial! Baste your card slots to the main interior piece. Use a 1/8in seam allowance and stitch down the two long edges. 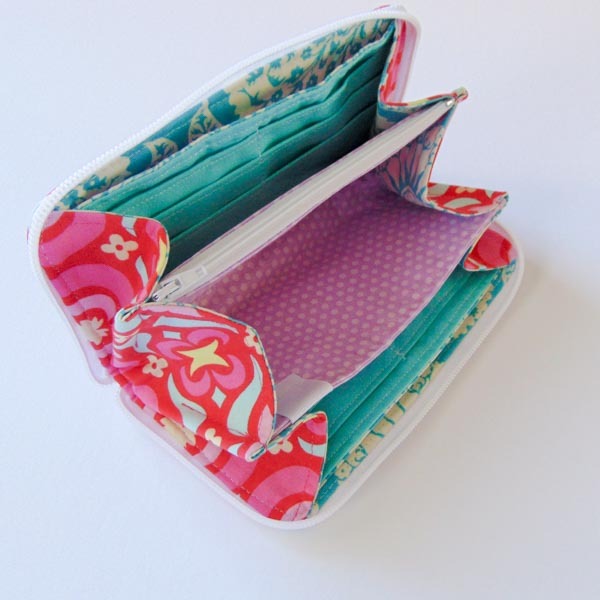 Now we will be cutting our slot to turn the wallet out when we are done sewing. We cut this slot now so there’s no chance of catching the exterior at the end! Cut a 3-4 inch slot just under your seam, make sure you catch ALL the layers! Baste your side flaps onto the interior with a 1/8in seam allowances to the sides. 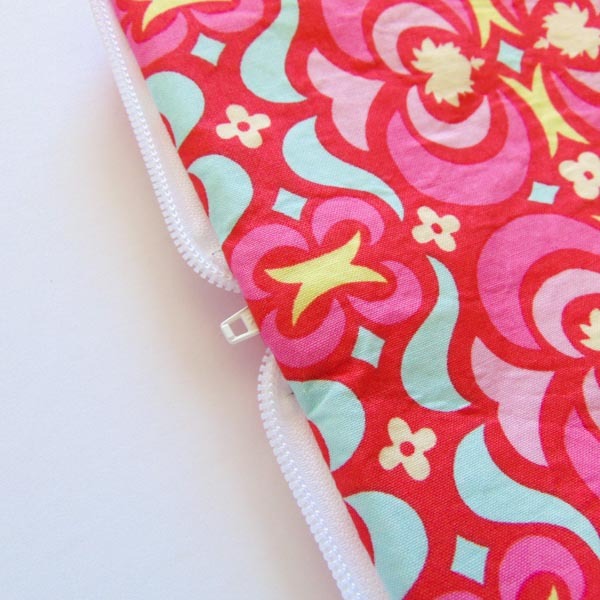 This will prevent them from sliding around when you sew in your zipper! Snip the corners so they follow the curves. Mark your zipper at 2.5in up from the end of the teeth. For this style, it’s the end of the zipper! Now we are going to mark the spots where the zipper will be clipped/sewn. On your EXTERIOR fabric, mark the middle along the long sides (Black arrow) then 5/8in (pink arrows) on each side of that mark. Do this on each long edge so the zipper lines up! You will start and stop sewing at the TOP 5/8in points on either long side! Make sure you start sewing on the side with your zipper pull! Stitch that side of the zipper down using an 1/8in seam allowance. Make sure you squash that zipper down as you sew. The nylon teeth will move any way you need them to. You will then clip and stitch the other side in the same manor, starting and stopping at the opposite 5/8 inch marks from the first side. 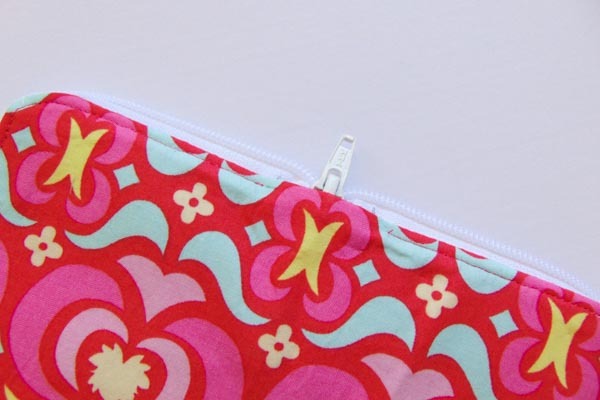 Clip your excess zipper out of the way as you sew! Start sewing again on the 5/8in mark that the zipper pull end is on or you risk the chance of your zipper stretching and not lining up! Once that zipper is attached, square off the excess zipper end. Fold the teeth to a corner and stitch 1/8in across the top to hold them in place. Clip off the excess leaving 1/2in overhang. For the end will the zipper pull, pin it towards the center. We will NOT be sewing across this side but it will keep it out of the way! Now that we have the zipper stitched down, we can stitch on the interior bits.With your interior bits RIGHT SIDE UP place your exterior with the zipper, RIGHT SIDE DOWN facing the interior. Line up the sides, edges and corners and clip all the way around it. Don’t be shy with your clips, use MANY! Make sure you push the zipper out of the way as you clip. Following along on the same stitches you have already done on the exterior (along the zipper), stitch those pieces together, this time using a 1/4in seam allowance! Remember you will NOT be sewing over the zipper pull side, rather starting and stopping at the 5/8in mark. (This can be seen where your previous stitching starts and stops!) You can sew over the end we cut short! Once you are positive everything looks OK, trim your seam allowance along the curves and 2 long edges. This will help reduce the bulk when you top stitch! Turn that wallet out from the slot we cut earlier. Pull the corners out nicely and lay everything as flat as you can. Before you give it a good press, pull the zipper out so you can just see the tip of the pull. Bonus tip: if you curl the zipper teeth towards the exterior, you will be able to iron it flatter and stop stitch better! DO NOT touch the teeth with your iron. You will be very, very, VERY sad if you melt it! Before we topstitch, I want to show you a trick! I pin all the layers before I stitch. This lets you pull the zipper out taut and helps flatten things to reduce the bulk! To topstitch, you will start about a 1/2in away from your zipper pull and go all the way around until you are 1/2in away from it again! Make sure your seam allowance for top stitching is no bigger than 1/8in or your zipper pocket will not fit! Don’t worry about that open bit where the zipper pull comes out. The fabric/zipper will be in so snug that it doesn’t need stitching/is near impossible to sew! Add a little glue in there if you feel needed to keep it secure! Cut Zipper end off 1/2in from the end of the teeth. Apply your zippered pocket as you normally would on the Necessary Clutch Wallet however, use a 4in wide by 3/4in box instead. You can make the box a little wider if you would like but that exterior zipper causes a lot more bulk that in the standard pattern! 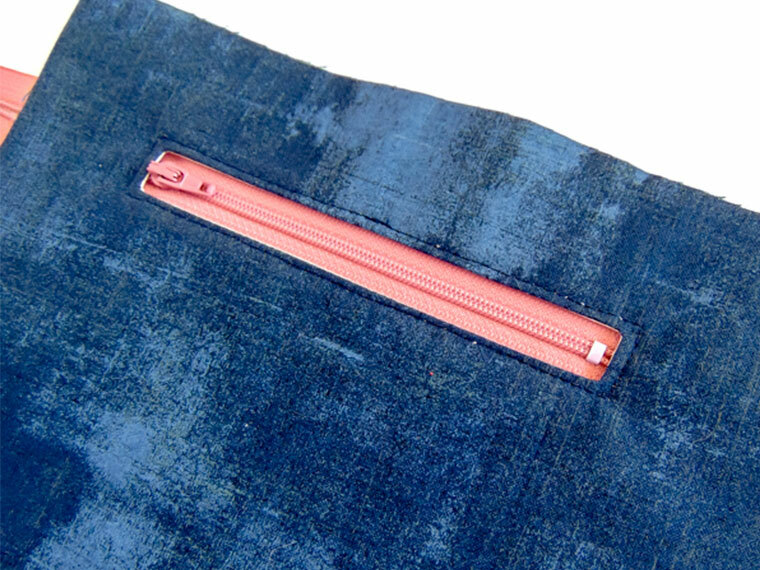 Finish up your side flap as described in the Necessary Clutch Wallet Pattern. Now zip up your wallet and enjoy your masterpiece! Still lots of cozy room inside! 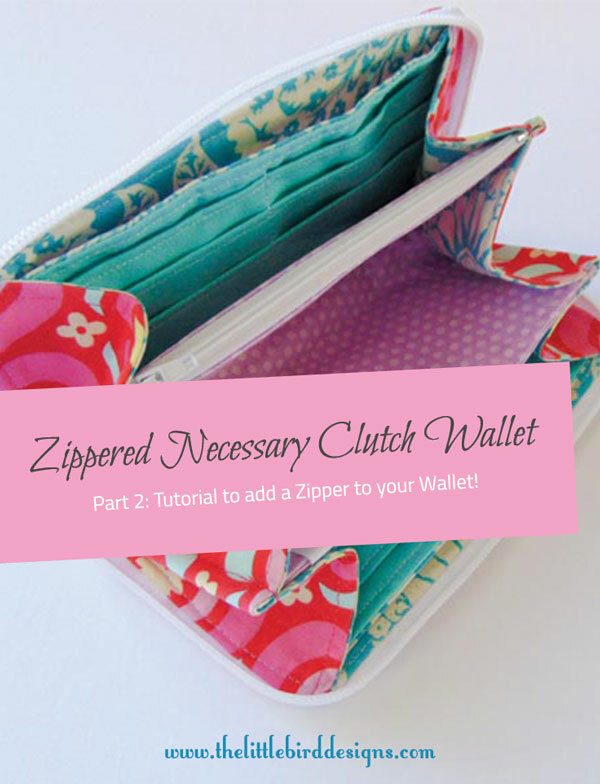 I hope you have enjoyed my UPDATED tutorial and that you enjoy making Zippered Wallets! I also have a little write up about how I do my Border Application of the Necessary Clutch Wallet if you would like to check it out! 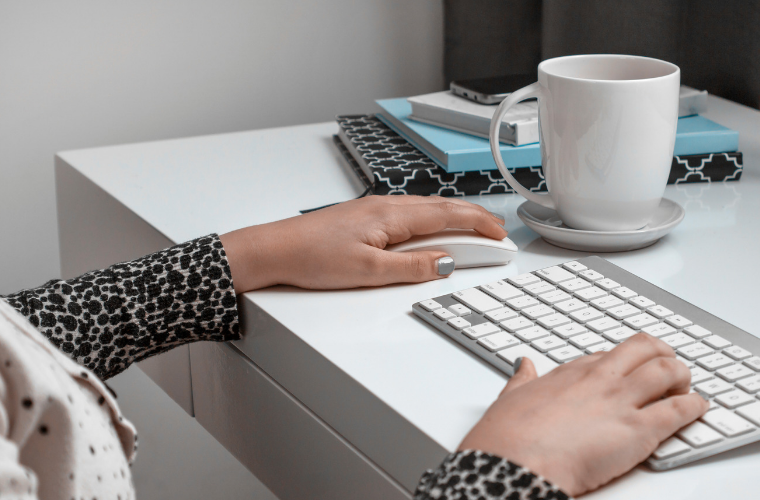 PLUS access to my newsletter! Fantastic! I’m so happy to hear that! Are you basting the credit card pockets and interior fabric right sides together? Hey Andrea. Once your backing is on the cards and top stitched, place on top of your inner lining piece face up and baste. Then it’ll be prepped for the next step! Hello again Aimee! I am to the point of putting the exterior piece on. Where is the zipper tab at this point? Looking at the pictures, it seems to be on sticking out beyond the wallet, but then wouldn’t it be in the lining and inaccessible? I am so close to the finish line and this is by far the best NCW I’ve done, even though only my 3rd. I love this zipper idea! I’m so happy to hear this Dawn! You will be able to squish the zipper pull in at the end when you turn it out as long as you don’t sew OVER both ends of the zipper stopping just before the teeth. This will allow you to pull the zipper pull through at the end! I hope that makes sense! So the zipper is sewn directly to the fabric…none of that, adding material to the zipper, kind of thing??? I sew it to the right sides of the card pocket, then place and sew the outside, right side down…wait, where does the zipper go? Inside? Sorry, I have to talk this through to make sure I understand. HI! Love this tutorial. Just wondering will having a ‘zip around’ work just as well for the mini NCW add on pattern? Hi Suzi, You totally could use this for the mini! It’ll just be a little tight in the corners 😉 I would leave out some of the excess interfacing on the cardslots, say about 1/4″ in on each side, to reduce the bulk! Would you be so kind as to write in the tutorial, “zipper faces up, when sewn to interior”? I just learned the hard way! Ditto. I have just sewn on my exterior to find out that the zipper should have been sewn on face up. This needs to be explicitly stated in instructions. Even looking closely at the pictures it was not clear. Now i have to pull it all apart and use another zipper. Until i got here the instructions were fine. Hi Terry, I am so sorry this has happened to you. I am in the process of updating the post and the photos but it will take time for the changes to be made. Please do follow along on my Facebook/Instagram as the final update notice will be made across all social media. Thanks so much! Thanks Aimee! I got my zippered NCW finished and it turned out nice. I am sure your updated instructions will be perfect! I had no troubles except with the zipper part. I added outside zipper pockets also!! Where can I find nylon zippers? I’ve tried metal and polyester. They do not work well. Can’t find nylon in anything other than white. Hi Linda, check out Emmaline Bags. They have incredible ones there! I believe WhoSaysSo in Australia has them as well! Hi there, the half circles hold the the zipper pocket in place as the side flaps in the original pattern. Let me know if that helps! I always get ugly wrinkles when I use Pellon Deco 809. Any tips? Hooray! Please share it with me on Facebook or Instagram after you make one! I find if you put a layer of a thin/featherweight interfacing on your fabric before the decor bond, you get a few less wrinkles. I also steam the crap out of it after I am done making anything with it! It gives it a nice crisp finish too! Thank you so much for the tut. I have made at least 12 of these wallets and I love them, the zipper will be a nice change. Thanks again. Hay! Can you do this with 2 interior zippers?